Once a year we open up Urban Native Youth Association’s head office and programming space to the public. Our staff comes together from UNYA’s 20+ programs across the city to haunt the halls in spooky, goofy, and creative costumes, and to share their knowledge about what we do, and how you can get involved. 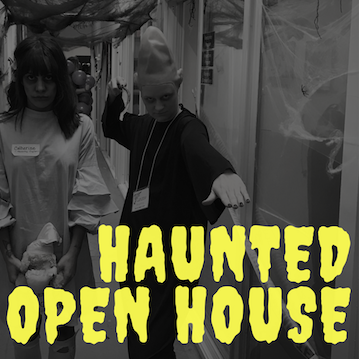 Join us for this year's Haunted Open House on Friday, October 19th, from 1:30 to 6:30 pm. You’ll have the chance to talk to staff and partners involved in our programs, enjoy some food and treats, and see incredible youth performances. We have a staff costume competition every year, with everyone doing their best to come with a better costume than the year before. It’s a perfect opportunity to spark your own creativity for Halloween this year! Youth are encouraged to fill out a passport to programs, and will have chances to win prizes throughout the day. We hope you’ll join us to learn more about UNYA, our programs, and our community. Everyone is invited – youth, families, and everyone interested in learning more about what we do.